For Flat Monitors up to 61" or 150 lbs. Designed for flat panel TV/monitors from 30-61" or up to 150 lbs, the versatile Chief TPS-2640 accommodates a large range of truss and pole dimensions, includes security options, and provides flexible features to achieve a custom installation for multiple applications. Perfect for exhibit, retail and digital signage applications, it also includes Chief's Q-Latch mounting system to secure the display with a lockable latch. 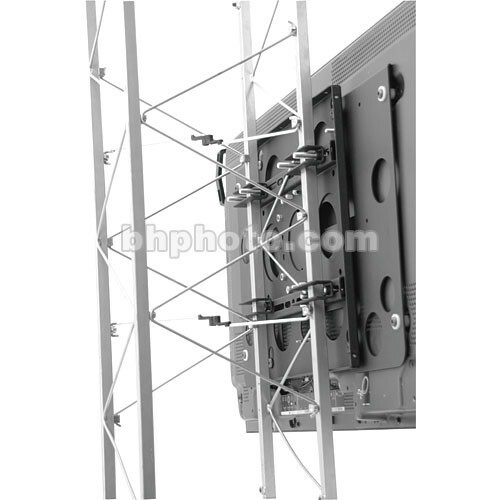 Note: Requires additional Pole or Truss kits for different size poles and truss work to complete installation. Choose from TPK-1 and TPK-2 Pole Kits, or TPK-3, TPK-4 or TPK-Truss Kits. Ultra low-profile, the mount sits snugly against truss or poles for an integrated look. Durably constructed with heavy-duty steel, accommodates a wide range of truss and pole dimensions to make a custom installation. 2 x Nut, Lock, Stover, 3/8"
2 x Washer, Flat, 3/8"